Here’s a list of ten of the scariest places I have visited in the country. One is located in La Union (Pindangan Church Ruins), two in Baguio City (Hyatt Terraces Hotel and SM City Baguio) in Benguet, one in Pampanga (Clark Air Base), one in Mountain Province (Sagada), one off Cavite (Corregidor Island) and the rest in Metro Manila. Though I haven’t really experienced any paranormal activity in these sites, probably because I don’t have a third eye, many others have. My wife Grace and I stayed in the 12-storey, 303 -room HYATT TERRACES HOTEL for three days in April 1986. Located on a pine tree-clad hill along South Drive, near Camp John Hay, the Hyatt Terraces Hotel was said to be the grandest hotel outside Metro Manila. At 4:26 PM, on July 16, 1990, a little over 4 years after our stay, a magnitude 7.8 earthquake struck Luzon, killing 1,621 people. Again, I happened to be in the city, with my family and some relatives, on the day of the devastating 1990 Luzon Earthquake but were lucky enough to have left the city before lunch. In Baguio City, 28 buildings collapsed during the earthquake. One of the most prominent buildings destroyed was the Hyatt Terraces Hotel when the central wing’s terraced front collapsed, like an accordion, onto the hotel lobby, killing 98 employees and guests. In the aftermath of that tragic earthquake, many of those listed as “missing” were never found and many say that there are still bodies in the debris of the hotel site and the spirits of these victims have never moved on. Its tragic history has surely contributed to its terrifying reputation. Today, its old fountain and a gated fence are all that remains of the still undeveloped site of the Hyatt Terraces. Now said to be haunted, strange lights and ghostly apparitions are said to have been seen around the empty lot. There was once a bus stop in front of the gate and motorists, driving along South Drive, have told stories of strange apparitions of the spirits of dead employees there. Some passersby in the area at night have also heard cries for help and seen figures against the spotlight that illuminates the area. In fact, for those driving along South Drive, the directed procedure is to honk your horn when passing beside the former Hyatt location, lest they run over a spirit crossing the street. Aromatic smells, coming out of nowhere, are also consistently reported. 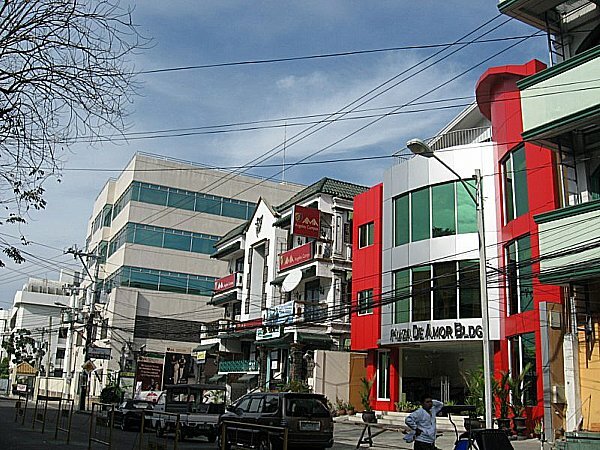 SM CITY BAGUIO (a favorite shopping venue of mine while in the city), opened in 2003, was erected on the site where the former 4-storey, wood-framed, 423-room Pines Hotel used to overlook Session Road. On October 23, 1984, at about 11:30 PM, a 6-hour blaze gutted this government-owned hotel. To escape the thick smoke and flames, most of the dead (17 were killed, including 4 Americans) and 46 injured leaped from windows of this American Colonial-style, hillside hotel while others were seen slipping from rescue ropes. Today, mall visitors have reportedly seen faces in bathroom mirrors that would not be there a second later. One patron, in the ladies’ room, gave a photographic description of a bloodied fireman (The Baguio City Fire Department lost four firefighters in the blaze). The MANILA FILM CENTER had its beginnings in 1981 when then First Lady Imelda R. Marcos started the Manila International Film Festival (MIFF). Slated to start on January 18, 1982, 4,000 laborers working, round the clock, in 3 shifts in the rush to complete the project in time for the MIFF. Tragedy struck, on November 17, 1981, shortly before 3 AM, when scaffolding and wooden support for part of the second basement collapsed, causing at least 169 graveyard shift workers to fall to the orchestra below and be buried or trapped under wet, quick-drying cement. Rather than halt construction to rescue survivors and retrieve the bodies of dead workmen, cement ordered to be poured into the orchestra, entombing the fallen workmen, some of them still alive. The MIFF was to last another year but, instead of quality films, pornographic films were shown in an effort to gain a larger audience and, perhaps, to make up for the first festival’s financial losses. Later, in 1984, I would watch the premiere of Tikoy Aguiluz’ startling, controversial but highly-acclaimed first full-length film “Boatman” (Ang Bangkero), in its uncut version, at this very venue. Today, it is the venue of the Amazing Show, a Las Vegas-like song and dance extravaganza where all the performers are transgenders. The place, said to be haunted as well as cursed, is incredibly spooky. Various ghostly manifestations were reported within the building on the site, including poltergeist activity, apparitions; mysterious hearing of cries and moans; bleeding walls; and hands sticking out from under doors. The ghosts of those who died are said to roam the area, looking for live bodies to possess and take over as their own. The UNIVERSITY OF THE PHILIPPINES Diliman Campus , where my wife and I graduated (with a degree of B.S. Architecture) has had a long history of alleged haunting, with a lot of paranormal hot spots. The Wilfrido Ma. Guerrero Theater, at the second floor of Palma Hall, is the residence of a ghost named “Marisa,” said to be a famous star of the university’s theater productions back in the 1970s who was eventually overshadowed by younger, more talented newcomers. Overwhelmed by grief and jealousy, she killed herself, in the most dramatic way possible, by hanging herself onstage, in costume. She’s known for making her presence felt by haunting the stage, the rest room and her old dressing room, joining the chorus during performances and, sometimes, showing up onstage. Benitez Hall, home to the College of Education and one of the oldest buildings on campus and, naturally, has gained the reputation as one of the most haunted. A ghost, with blood red eyes, is said to wanders the halls. Kalayaan Hall, a residence hall exclusively for freshmen, has a ghost of a woman who supposedly shows up in the mirror facing the stairs to the second floor of the girls’ wing. Abelardo Hall, home of the College of Music, is said to be haunted by the ghost of a girl vocalizing, or playing the piano or the gamelan in the middle of the night. The PINDANGAN CHURCH RUINS, the picturesque, roofless remains of a small vine-covered brick and coral church (the first in City of San Fernando, La Union) which I visited way back in 2004, is located 500 m. off the National Highway, near Camp Oscar Florendo. The nuns of the Carmelite Monastery of the Holy Family are the caretakers of these church ruins. It is said to be the home of the sole ghost of a headless stabbed priest who prowls the night, either carrying his severed head or searching for his head. Some have also reported hearing his head calling out for his body to find it. The wind here is known to whisper strange malediction to those that disrespect the location. My picture of the site was featured in an episode of “Ang Pinaka: Scary Places in the Philippines,” aired during the 6:30 PM GMA News TV last October 22, Sunday. The University of Santo Tomas, where my daughter Cheska graduated (with a degree of B.S. Medical Technology), served as an internment camp during the World War II. Many prisoners died here of starvation and illness, and is reported by believers to be haunted. An alleged mass grave is located near the UST Museum. One of the restroom cubicles in the Main Building is also haunted by a female student who hung herself. Other paranormal hot spots are the UST Hospital (haunted by a ghost wearing a red tag, which only corpses in the morgue section wear), St. Raymund’s Building (the comfort rooms on the first floor are haunted by the ghost of a girl was said to have committed suicide because she was bullied for her physical appearance), the Albertus Magnus Building (the Conservatory of Music where the piano is heard playing by itself) and Benavides Park (a.k.a. Lover’s Lane) where, at past midnight, students are greeted by a man wearing a Dominican habit who would later disappear (Sometimes, unfortunate couples hanging out in the park’s benches at night, have also heard a disembodied voice singing mass songs). CLARK AIR BASE, being an American military installation, experienced major bombing from the Japanese during World War II. There are a number of reminders of that bloody past that still exist today and these locations are some of the most haunted in the Philippines. The area around the abandoned Clark Air Base Hospital has been rendered off limits to everyone as inhabitants have witnessed apparitions of violent spirits and heard mysterious voices. Early morning joggers have also reported hearing party music and excited talk coming from inside the obviously empty Home Plate canteen. At the Clark Museum, the ghost of a serviceman who committed suicide by hanging himself still haunts the place. SAGADA, in Mountain Province, has an authentic culture dealing with death, free of Western influence. The caves of the town, in particular, are rumored to be site of ghostly mischief. According to the locals, whispery voices are heard and wayward shadows or apparitions are seen among the Hanging Coffins as well as graves up in the Echo Valley. The Igorots, however, generally say that if you show some respect and leave the coffins alone, you’ll make it out of the valley unscathed. At Sumaguing Cave, locals believe that the cave is haunted by the spirits of their ancestors. I have explored this cave twice and, each time, I always felt an otherworldly feeling as I entered. Historic CORREGIOR ISLAND, an island of history and heroism at the entrance of Manila Bay, has played a major role during World War II. Many Filipino and American soldiers died in its defense. During the liberation, the Japanese defenders here committed suicide via harakiri, jumping into the sea or blowing themselves up instead of capture or surrender. The ghosts of Corregidor’s World War II dead were also joined by Muslim soldiers who, in 1968, were training in Corregidor for a planned invasion of Sabah in Malaysia but were exterminated during the infamous March 18, 1968 Jabidah Massacre. At the Hospital Ruins, tourists who passed by have heard footsteps, rumblings of normal hospital activities, and wails of people. One of the laterals of Malinta Tunnel. Notice the orbs? Around the bunker area inside the Malinta Tunnel, shouts of people grimacing in pain can also be heard. Witnesses have also reported hearing eerie sounds and seeing a spirit near by. Manifestations would also appear in photos and videos. In INTRAMUROS, where the historical and the supernatural intersect, the possibility of ghost sightings in the oldest part of Manila is real. It attracts ghosts and ghost hunters in search of kapres, white ladies, demonic spirits, and other entities. In the dying days of World War II, Japanese soldiers reportedly massacred men, women and children in Baluarte de Dilao. Baluarte de San Diego, known as the break-up park for being the site where many a relationship met their demise, is where a crying White Lady often makes appearances. The Aduana (Customs House) Building, which housed several government offices, is the most haunted building in Intramuros. Many people believe its demonic entities takes lives. At Plaza Mexico, there have been sightings of reapers, or hooded figures who chase after wandering spirits. Many of the retail and commercial spaces along the wall of Puerta de Sta. Isabel have now been abandoned, supposedly because of numerous reports of hauntings. An ordinary-looking tree, along Arzobispo Street, has earned the gruesome nickname the Suicide Tree after a student, supposedly from Mapua Institute of Technology, killed herself by hanging. Headless priests supposedly make regular appearances at the Manila Cathedral. Fort Santiago, where National Hero Jose Rizal was jailed, was used by the Japanese as a prison and torture chamber during World War II. It is imprinted with the agony and sufferings of its many prisoners and is now also extremely haunted with ghosts of prisoners who drowned in its underground dungeons. Upon the invitation of Mr. Thelmo “Buddy” O. Cunanan Jr., honorary consul of Georgia in the Philippines, I joined a group that would cover the Colors of Hope exhibit of Mr. Pancho Piano, the first Filipino artist to officially present his work in Georgia and the entire Caucasus region. Aside from Buddy, Pancho and I, also joining the group were Ms. Riva M. Galveztan (health food advocate) and Prof. Melissa “Mel” Dizon-Dulalia. Our Republic of Georgia odyssey was to last 11 days (November 24 – December 4, 2014). On the first day of our trip, I met up with Buddy at Resorts World where a bus was to take us Diosdado Macapagal International Airport at Clark Freeport Zone, Pampanga. Along the way, we picked up Pancho Piano at Centris Mall in Quezon City. Upon arrival at Clark, we met up with Mel at the airport. Riva was to meet us in Tbilisi on another flight the day after our arrival in Tbilisi. While waiting for our flight, all four of us had a late breakfast at the VIP 1 Lounge of the airport. We all left the airport on the 10:50 AM Qatar Airways (QR 931) flight on board a Boeing 787-8 aircraft. A rather long 9-hour flight brought us to Hamad International Airport in Doha, Qatar, our first stopover, arriving there at 2:50 PM (Doha time). Here, Pancho, Mel and I were in for a long 17-hour layover. Buddy opted to leave the airport and check in at a hotel in Doha. We whiled the time away admiring the artwork, taking turns sleeping on airport lounge chairs and, come morning, having breakfast at a Burger King outlet. Buddy joined us the next morning in time for our 7:45 AM (QR 251) connecting flight to Tbilisi, this time on board an Airbus A320 aircraft. Normal flight time is 3 hours and 15 minutes but we made a 1-hour stopover in Heydar Aliyev International Airport in Baku (Republic of Azerbaijan) to offload as well as load some new passengers. We arrived in Tbilisi International Airport by lunchtime where we were met by Ms. Ruby Bebita, a Filipina working in Tbilisi, who assisted us in getting a place to stay in the city. After buying and installing local SIM cards at the airport, we boarded a taxi to bring Pancho, Mel and Buddy to a hostel, near Meidan Square, while I stayed at the nearby Envoy Tours Hostel. Envoy Tours Hostel: 45 Betlemi Street (on Junction to Orbiri St. leading up to the Narikala Fortress), 0105 Tbilisi City, Georgia. Tel: +995-322-920-111. Website: www.envoyhostel.com. On the last day of our 5-day Lakbay Norte 2 media tour, we were to attend a cooking demonstration by local culinary expert and historian Lilian “Atching” M.L. Borromeo in Mexico, Pampanga, but we were early for once so our special Victory Liner media bus made a brief stopover at the provincial capital city of San Fernando, parking along A. Consunji St. in Brgy. Sto. Rosario. A number of,Spanish and American-era ancestral houses were located here so much so that a number of us, me included, alighted and made a walking tour for some photo ops while the others stayed in the airconditioned comfort of the bus. 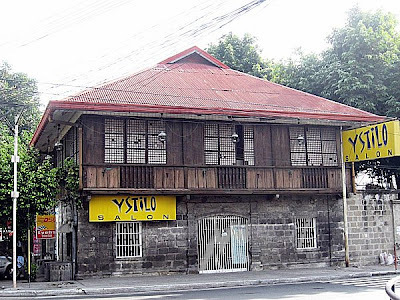 The Hizon-Singian House, built in 1870, was occupied during the 1896 revolution by Spanish Gen. Antonio Ruiz Serralde. During World War II, it was used by the Japanese Imperial Army as a military hospital and barracks (1943-44) and, during the liberation period until the end of 1945, served as headquarters of 6th Army of American Gen. Walter Krueger. The Lazatin residence, built in 1925, exemplifies the architecture prevalent during the American colonial period. During World War II, it served as a residence of Japanese Gen. Masaharu Homma. On January 27, 2003, both houses were declared as Heritage Houses by the National Historical Institute. 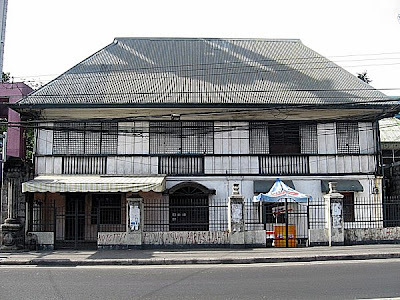 Other ancestral houses along this street include the Consunji house, the turn-of-the-century, Victorian-style Augusto P. Hizon house and the Pampanga Lodge and Restaurant (the first site of the Pampanga High School when it first opened and, later, of the Harvardian College). From Bacolor, we next proceeded to Brgy. Betis in the woodworking (furniture, guitars, pool sticks, etc.) town of Guagua, my late father’s hometown, where we were welcomed by Sangguniang Bayan member Anthony Joseph “Tonton” Torres and Guagua councilor Roy Sunglao at the 17th-century Church of St. James the Apostle. The church, now honored as one of 26 National Cultural Treasures by the National Museum, has a profusely ornamented, two-level, German Baroque façade with decorative, coupled columns and skillfully arranged flora, spirals and intricate curvilinear carvings decorating the projecting portico. The church’s wooden entrance doors are intricately carved with the “Dreams of Jacob” from the Old Testament. Pampanga Convention and Visitor’s Bureau (PCVB): c/o Everybody’s Café, Nepo Mall, Brgy. Del Pilar, City of San Fernando, Pampanga. Mobile number: (0917) 245-4834. E-mail: poch168@gmail.com. We were now on our fifth and last day of our Lakbay Norte 2 media tour and come morning, after a hearty breakfast at Sands Resto Grille in Lighthouse Marina Resort, we were on the road again in our special Victory Liner media bus, this time to return to Pampanga and visit two of the province’s famous churches—one noted for its resiliency in the face of calamity, and the other for its artistic beauty. In Bacolor, we were met at the town’s Church of St. William the Hermit by Mr. Poch Jorolan of the Pampanga Convention and Visitor’s Bureau (PCVB). 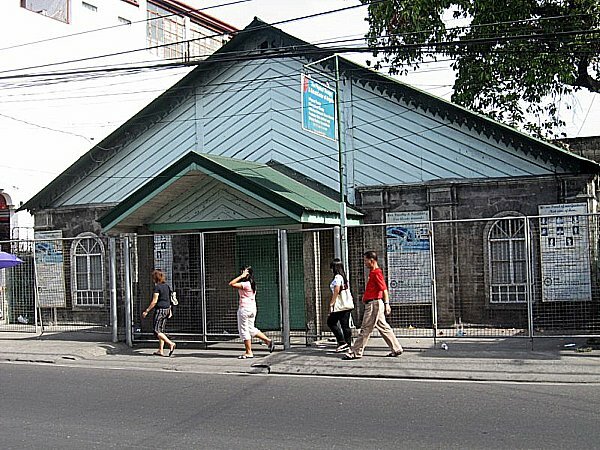 This church, one of the oldest and largest churches in the province, is a survivor. Probably built in the early 17th century, it has survived damage from the 1645 and 1880 earthquakes, a fire in 1672, as well as heavy damage during the British occupation, being restored each time. However, the Mt. Pinatubo eruption produced lahar flows on September 3, 1995, forcing its more than 50,000 residents to evacuate to safer ground and burying the church up to one-half its 12-m. height. Its 4.9-m.-high main entry disappeared. However, this bastion of faith refused to follow the footsteps of the half-buried Cagsawa Church (Albay) and Guiob Church (Camiguin), all victims of the violent eruptions of Mt. Mayon and Mt. Vulcan Daan, respectively. Bacolonians painstakingly dug up the ornately-carved main and side altars, century-old statues and the retablo (altar backdrop) of the Lady of La Naval from the mud and relocated the retablo under the dome in order for it to fit. They also built a new concrete floor almost at the level of the windows. The profusely and intricately ornamented window of the choir loft now serves as the new main entrance. Pampanga.Convention and Visitor’s Bureau (PCVB): c/o Everybody’s Café, Nepo Mall, Brgy. Del Pilar, City of San Fernando, Pampanga. Mobile number: (0917) 245-4834. E-mail: poch168@gmail.com. The third day of our Manila North Tollways Corp. (MNTC)/North Philippines Visitors Bureau (NPVB)-sponsored Lakbay Norte 2 media tour did not end with our tiring but rewarding Pinatubo trek and our P.D.C. Spa Town pampering as our media group was invited for dinner at Angeles City in Pampanga, a major provincial destination as almost 3 days of our 6-day tour were to be spent in this history and culture-rich province with its many Spanish and American-era architecture. It was already night time when our special Victory Liner tour bus finally made its way to bustling Angeles City, arriving at its 2-storey Museo Ning Angeles. As dinner guests of the Kuliat Foundation, we were all warmly welcomed at the entrance by Ms. Herminia Pamintuan, wife of City Mayor Edgardo Pamintuan; Ms. Joy Cruz and Ms. Prisca Cantor, special projects head and treasurer, respectively, of the Greater Clark Visitors Bureau (GCVB); and museum curator Ms. Jiji Paras. The menu was truly impressive with a choice of vegetable salad, paella, chorizo pizza (courtesy of Armando’s Pizza, the Kapampangan pizza), kare-kare, batute (stuffed frog), crabs and kakanin for dessert. We were also regaled with a cultural dance performance by a dance troupe. Museo Ning Angeles: Old Municipio Bldg., Sto. Rosario St., Angeles City, Pampanga. Tel: (045) 887-4703. E-mail: angelesmuseo_kfi@yahoo.com. Website: www.angelesmuseum.com. Greater Clark Visitors Bureau (GCVB): The Boardroom Business Center Bldg., 7160 Claro M. Recto Highway, Clark Freeport Zone, Pampanga. Tel: (045) 499-1146. E-mail: gcvb08@yahoo.com. The 2-storey Museo Ning Angeles, also called the Angeles City Museum, is located adjacent to the Holy Rosary Cathedral. Showcasing the Kapampangan lifestyle and culture, this city museum was established in 1999 through the Kuliat Foundation and is housed in the former City Hall built in 1922. On display are interesting handiwork of Angeles City artists and rare photographs relating to the Philippine-American War and the history of the city. The museum also has a charming diorama exhibit of Ninay Dolls (created by Patis Tesoro, an Angeleña) showing various episodes of Kapampangan lifestyle (weddings, fiestas, woodcarving, etc.). One of the museum’s permanent exhibits is the Angeles City Hall of Fame, honoring Angeleños who have excelled in serving the city and have made significant contributions through their different fields of endeavor. There’s also a display on the evolution of Philippine revolutionary uniforms (1806-1906)It also has a museum shop selling locally-made products. 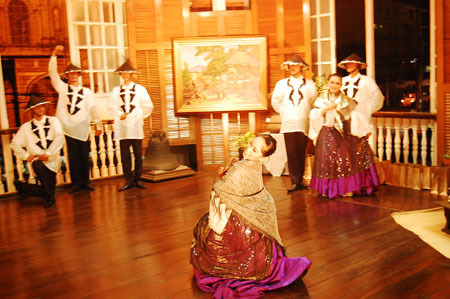 A special exhibit, the Culinary Arts of the Philippines, at the second floor, was inaugurated in October 2007. It showcases different Filipino cuisines from various regions in the country. Also on display are a collection of native kitchen tools used in ancient times. Its library has a collection of books about Philippine recipes. Museo Ning Angeles: Old Municipio Bldg., Sto. Rosario St., Angeles City, Pampanga. Tel: (045) 887-4703. Open Mondays to Saturdays. Admission: PhP10. E-mail: angelesmuseo_kfi@yahoo.com. Website: www.angelesmuseum.com. After watching the early morning flight of Clark’s famous hot air balloons, Jandy and I returned to our Toyota Revo and made our way out of Clark as we still wanted to explore nearby Angeles City. Along the way we made brief stopovers at some of Clark’s historical sights. Our first stopover was at the old parade grounds. The Fort Stotsenberg Gate Posts once stood at the Dau Gate, the first gateway to Fort Stotsenberg , from the early 1900s until the Japanese Occupation in 1942 when they were removed and buried as landfill. Unearthed intact in 1965, these posts were moved to the American Legion Post (near the Personnel Office and not far from the Clark Gym) and finally relocated to the south side of the entrance of the parade grounds in 1984. Near the old parade grounds, on the original site of the 217-bed base hospital (dating to September 1903) and the Base Commander’s office, is the Clark Museum, also called the Kapampangan Museum. Inaugurated on July 5, 1997, it It showcases Clark’s rich history and transformation, from the time it was used as a U.S. military base in 1902 up to its present development as a Special Economic Zone. A large mural depicting the vision of Clark Development Corporation (CDC) and five dioramas portraying the transformation of Clark into its present state are among the exhibits at the museum. Also on display are photos, models of U.S. aircraft, Philippine currency during the Japanese Occupation, weapons, uniforms, a Mt. Pinatubo exhibit and the Jack and Ariella Nasser Art Collection of more than 100 paintings done by well-known Filipino painters. In front of the museum is a Spanish-era cannon and a Japanese World War II anti-aircraft gun. The old cannon, its barrel cast in Peru in 1778, was formerly mounted in the Spanish warship Seville. The cannon was uncovered in 1954 during excavations in Sapang Bato in Angeles City. At the entrance of the Clark Veterans Cemetery, along the main entrance road, just past the main gate, is the Death March Marker. This memorial marker was erected by the Manila BPO Elks lodge in honor of fellow Elks, American and Filipino POWs, who passed this spot during the infamous Bataan Death March in 1942. Just inside the Main Gate, along the Mitchell Highway, is the 20.365-acre, 12,000 plot Calrk Veterans Cemetery, formed between 1947 and 1950 to house 7,559 military and civilian remains. 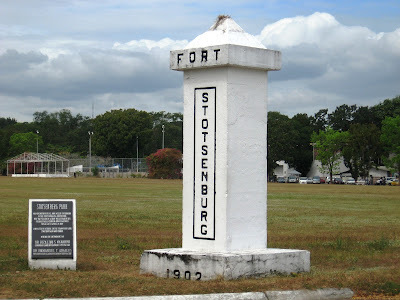 There are headstones/markers and remains from at least 4 other U.S. military cemeteries (Fort Stotsenberg 1 and 2, Fort McKinley and Sangley Point Naval Cemetery). These include 2,030 fallen American soldiers, including at least 638 Philippine Scouts (PS) from the pre-World War II era. Some, but not all, were veterans of the Spanish-American war and the Philippine-American War. 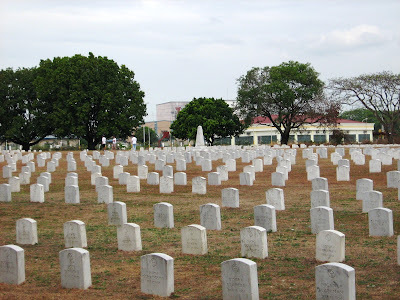 Others are graves of U.S. veterans from the U.S. Army, U.S. Navy, U.S. Marine Corps, U.S. Coast Guard and U.S. Air Force who died after World War II (all World War II dead were moved to the American Cemetery in Manila) and during the Korean and Vietnam War. The largest category interred is civilian, mostly U.S. and Filipino, all of whom worked for the U.S. government, and their dependents. In addition, nationals from France, Spain, Canada, Japan, China, Vietnam and India are also buried there. A little over 1,600 remains are still unidentified. The cemetery is also the only place in the former U.S. 13th Air Force base where the U.S. flag flutters alongside the Philippine flag. Finally, at the main gate entrance to the Clark Freeport Zone, at Bayanihan Park, is the Salakot Arch, a cavernous welcome landmark fashioned after a farmer’s hat built in 1979. It stands as a sign of Philippine-American friendship over the years and was originally built to symbolize the historical March 14, 1947 signing of the RP-US Military Bases Agreement. Beyond the arch is Angeles City. Clark Museum: Bldg. 2096, Clark Special Economic Zone, Pampanga. Open Mondays-Fridays, 8 AM to 5 PM. Special arrangement during weekends. Admission: PhP30 per person. Admission is free for tour guides, teachers and children below 3 years of age. Advanced booking is required for groups numbering more than 30 people. Director: Ms. Ceffie Yepez. Tel: (045) 599-3221. After the culmination of Clark’s Hot Air Balloon Festival, Jandy and I drove on to Angeles City for a walking tour of the City of Angels. Many know Angeles City only as a rest and recreation area frequently visited by the U.S. servicemen from nearby Clark Air Base. Even with the base’s closure, Angeles is still home to a large colony of expatriates as many Americans chose to permanently settle in city, particularly in the Balibago District. They were just about everywhere I looked in the city. However, not many people know that, on March 17, 1899, Angeles was briefly made the capital of the First Philippine Republic by Gen. Emilio Aguinaldo. In fact, the first and only anniversary of the Declaration of Philippine Independence (June 12, 1899) was celebrated here. Upon its capture by the Americans on November 5, it was made the headquarters of Maj.-Gen. Arthur MacArthur (father of Douglas). Angeles, once just a jungle clearing and a northernmost barrio of San Fernando called Kuliat (after an indigenous vine that grew abundantly in the area), soon grew rapidly around the former Clark Air Base and was made into a chartered city on June 22, 1963 by virtue of Republic Act No. 3700. Many relics of the city’s Spanish and American era past still exist, all within the Sto. Rosario Historic District and all within walking distance from each other. My walking tour started at the Holy Rosary Cathedral (where I parked my car), along Sto. Entierro corner Sto. Rosario St. The Holy Family Bldg., the former convent, was used by the U.S. Army from August 1899 to December 1900 as a military hospital and by the Japanese Army as a troop barracks, officers’ quarters and arsenal in early 1942. Adjacent to the cathedral is the 2-storey Museo Ning Angeles, the former City Hall built in 1922. This museum, opened on December 8, 1999, now showcases Kapampangan lifestyle and culture. The Angeles Physical Therapy Rehabilitation Center, now a center for polio and stroke patients, was first built in 1899 as the deposito for religious statues and carriages used in religious processions. From 1899 to 1901, it was utilized by the U.S. Army as a jail for recalcitrant U.S. troops and, from 1946 to 1947, as headquarters of U.S. Army 11th Film Exchange. From February 6, 1967 to 1986, it was the City Post Office. The oldest building in the city is Bale Matua, also known as the Founder’s House. It was built in 1824 by Don Angel Pantaleon de Miranda, the former gobernadorcillo of San Fernando, and his wife Doña Rosalia de Jesus. Together, they founded Angeles in 1796. On December 8, 1829, the barrio was separated from San Fernando and was renamed Angeles in honor of Don Angel and the town’s patron saints, the Holy Guardian Angels (Los Santos Angeles de los Custodios). To build Bale Matua, Angel used materials salvaged from their older house built around 1811. 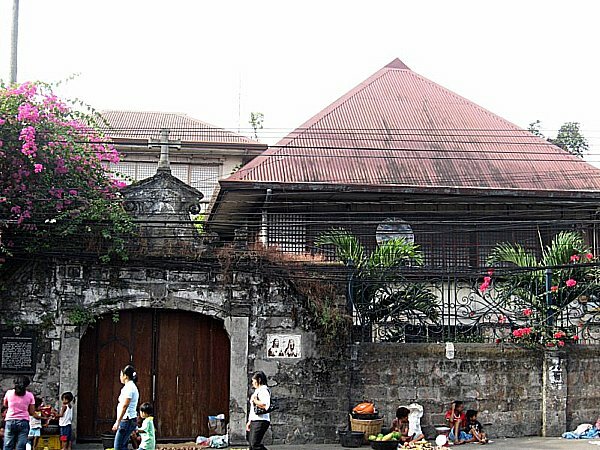 The house was later inherited by their only daughter, Doña Juana de Miranda de Henson. It has high stone walls and an ornate gate and was declared as a Historical Site by the National Historical Institute. The Nepomuceno Ancestral House, along Sto. 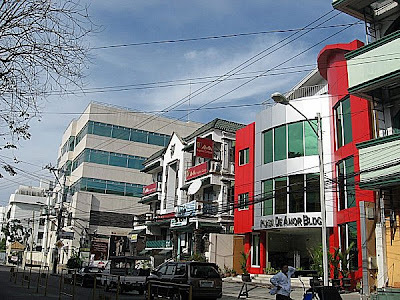 Rosario St., was the home of Don Ciriaco de Miranda, the first gobernadorcillo of Angeles. 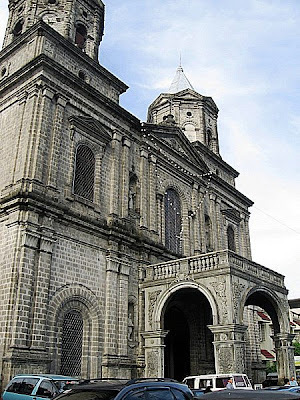 Built in 1840, it was inherited in 1868 by Don Ciriaco’s niece, Doña Agustina Henson de Nepomuceno. A restored grain storehouse (kamalig), along Sto. 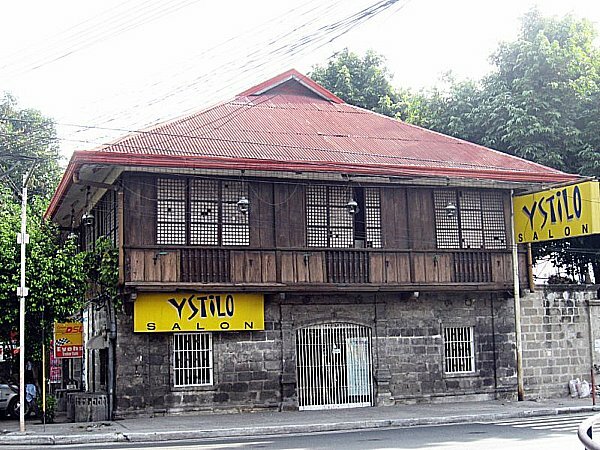 Rosario St., between these two old houses, was also built in 1840 by Don Ciriaco. In 1980, it was restored by Armando L. Nepomuceno and is now home to Armando’s Pizza and the Camalig Restaurant. Bale Herencia, at the corner of Lakandula and Sto. Rosario Sts., was built in 1860 by carpenters from Vigan (Ilocos Sur). Said to have been built for the mistress of a parish priest, the current owners now use it as a banquet hall.